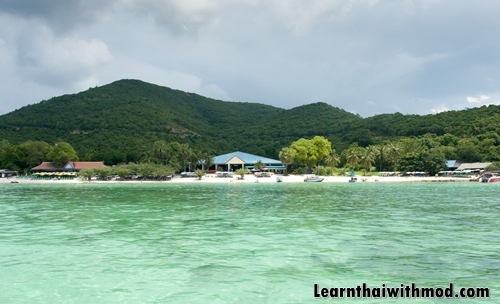 Lan island (Thai: เกาะล้าน) is a beautiful small island located only seven kilometers off the shore of Pattaya. On my first visit to Koh Lan few years ago I couldn’t believe there was such a wonderful island next to a busy city like Pattaya. I felt like I found a rare gem, this is a perfect place for a weekend getaway. The island is 4 km in length and 2 km in width.There are approximately thousand residents living in the main village. There is also a school and a small medical facility on the island. หาดตาแหวน Tawaen Beach is the most popular beach on Koh Larn because of full facilities. It has 750 m long white sand beach. The atmosphere of this beach is not different from Pattaya beach, where tourists can enjoy many beach activities. If you don’t like the crowd and want to avoid tens of vendors tying to sell you the tourist stuff, I recommend you to select the other beaches. หาดทองหลาง Thong Lang Beach is 20o meters long, it is used to be popular, but now it seems to be quiet. Abundance of coral reef in this area allows tourists to explore the sea life by snorkeling. หาดสังวาลย์ Sangwan Beach is a small beach next to Ta Waen Beach,but quieter and more private. It has white sand and clean beach. หาดแสม Samae beach is quite a long beach, approximately 700 meters. Its atmosphere is similar to Tawaen beach because of large number of tourists. There are a lot of restaurants and some accommodation along the beach. Those who would like to watch the sunrise and sunset, this beach is a spectacular spot. หาดนวล Nual Beach is quiet, and there are a lot of reefs in the water, makes a great spot for snorkeling. หาดตายาย Ta Yai Beach is so small that visitors can walk from one side to the other side within five minutes. The beach is quiet as there are fewer tourists, and there is only one shop available here. The water is crystal clear. I visited this beach on my first time to Koh Lan and I was really impressed. That was when I learnt Pattaya was not so bad! It is a suitable place for a big city getaway. I can’t remember which beach this is. I took this photo when I was in the boat. 7.หาดเทียน Tien Beach is is exceptionally clean and quiet.The beach is 500 meters long. Sport activities such as jet ski and banana boats are available. 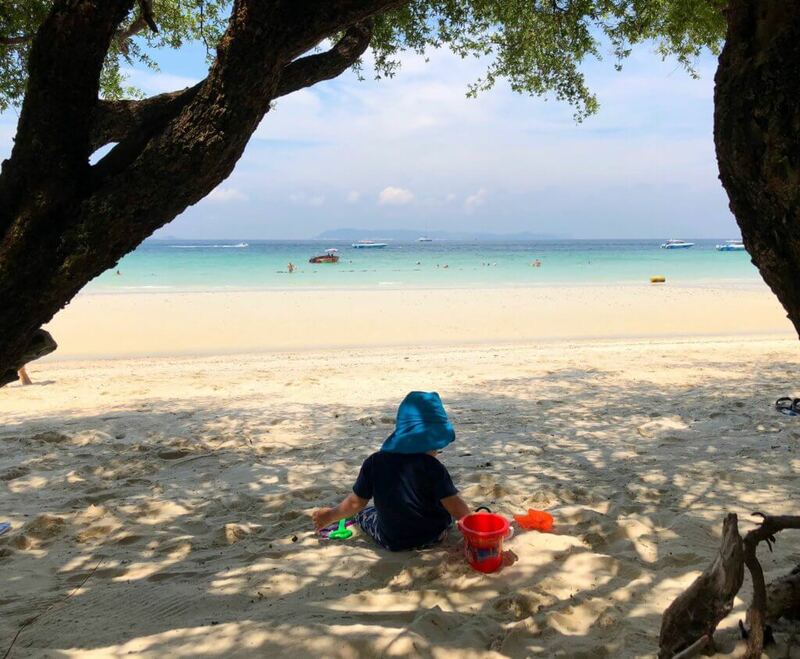 On a day trip to Ko Lan with my friends, we stopped at ‘Tawaen Beach’ first then we couldn’t stand too many tourists so we came to this beach and we totally loved it! My best friend and I at my favorite beach in Koh Lan, Tian beach. Ferry: You can take a ferry which costs only 30 Baht from Bali Hai pier. The trip takes about 45 minutes. The first ferry departs Bali Hai pier at 07.00 am and the last ferry departs at 06.30 pm. While the first ferry from Koh Larn to Pattaya departs at 06.30 am and the last ferry is at 06.00 pm. 2. 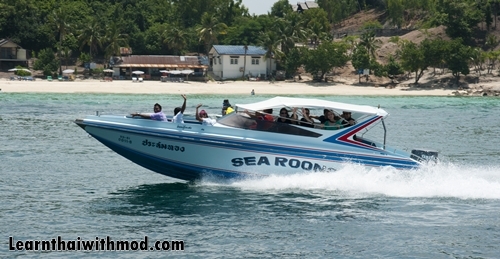 Speed boat : if you prefer a faster and more private transportation, you may like to hire a speed boat. The cost varies from 1,500 – 2,000 Baht depending on the size of the boat. You can also join a group for 300 Baht per person per leg. It takes 15-20 minutes from Pattaya Beach or Bali Hai pier. If you come to the island by a ferry and plan to stay in one beach all day, taking a blue songthaew (a converted pick up truck with two benches in the back) is inexpensive, convenient and safe! From Na Ban pier, just walk to the temple which is located about 5 minutes walk and you will find the songthaew station there. Just tell a staff your beach destination and they will point out the truck you need to get on. The fare is only 30 Baht per person. When I went to the island with five of my friends, we hired three motor bikes to go around and see the life on the island. If you don’t want to stay in one beach and prefer to explore the island around, hiring a motorbike is a good option since it is convenient and easy to navigate. It costs only 200 Baht per day. I was surprised they did not require any ID or deposit money from me and my friends when we hired the bikes, I am not sure if they would ask those from foreign tourists like they usually do it other places. 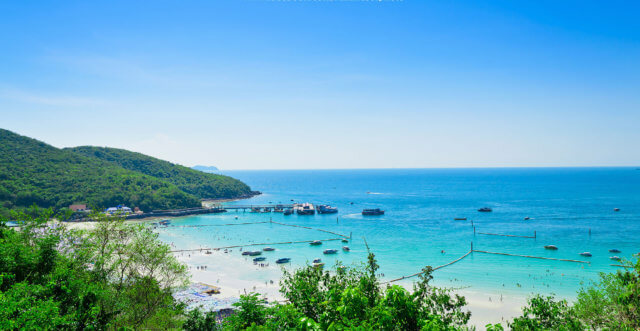 A day trip to Koh Larn from Bangkok, you can catch an early bus from Ekamai bus station to (every half hour from 6a.m.) or hire a taxi/a car with a driver. You could get the 6pm return ferry, and still get back to Bangkok on the same day. On 22d September, I revisited Koh Lan after haven’t been back for a few years. This trip I chose “หาดเทียน Haad Tien” again. I was very happy to see that the beach was still clean and the water was crystal clear. Although this time the beach was full of groups of Chinese tourists, I still found my quiet spot to sit down and enjoyed the good seafood. There are shady areas under the trees on this beach, you may bring a floor mat so you don’t need to rent a beach chair for 100 Baht. You can bring your own snack, food and drinks. Don’t forget your sunglasses and hat (I did!). The sun can be scorching! Im inspired to read your posts. 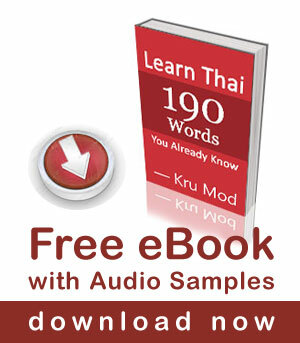 Love to learn Thai. Will visit Koh Larn this month end. That’s nice! I haven’t been to Koh Lan for a long time. Enjoy your trip! It’s really wonderful pleace! I’m russian. I stayed here for a night in a Rainbow hotel near the Naban Port. I was lucky enough to meet a charming motobike taxi driver, who has arrived at any place within 10 minutes by a telephone call and could take me to any place on the map of the island. While I was looking for the room for rent, I met the mistress of a small restaurant. So friendly women! Нer family gladly met me for dinner with his restaurant after sunset. I woke up at 4 am to see the beautiful sunrise on my balcony. Thank you for this post! I’d love to visit the island again! I noticed you mentioned Jet Ski in Tien Beach. How much for jet ski ride here? Pattaya and certain parts of Phuket are [in]famous for jet ski scams towards tourists. Did you notice anything unpleasant going on with renting a jet ski there? Is it possible for you to do an article on Jet ski in Thailand? Thank you for this article Mod. 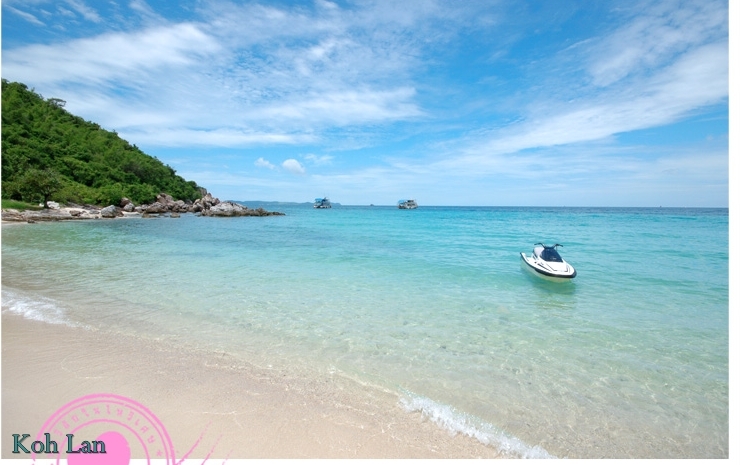 Would you recommend koh lan more than koh samet for a 2 night stay? Hi Mod. Which do you think is better for a 2-3 day stay — Koh Samet or Koh Chang? 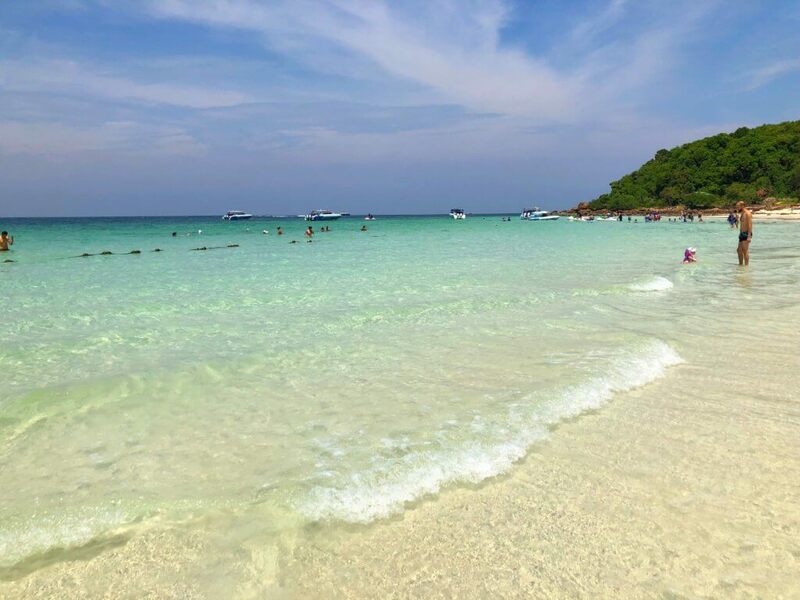 If you plan to travel by car from Bangkok, I think Koh Samet is better as Koh Chang takes half a day to get there so you will lose one full day on the road round trip. Koh Samet is in fact perfect for 2-3 days getaway. Have fun! The island is beautiful indeed. Have been there several times. Love the monkeys running right on one of the beaches!